Hi, it’s Amy from Hertoolbelt, back with another build plan. In case you missed the last project, we built a vintage crate shelf to get organized. This weeks project is a sleek mid-century modern desk that is inspired by this sweet desk. This modern desk was previously available on Dot & Bo. Their desk was made from walnut which is gorgeous, but we can get a similar look with pine for less. There are a few variations that can be done with this simple mid-century modern desk build. Make a desk with a single panel. Build a sleek box for a little added storage. 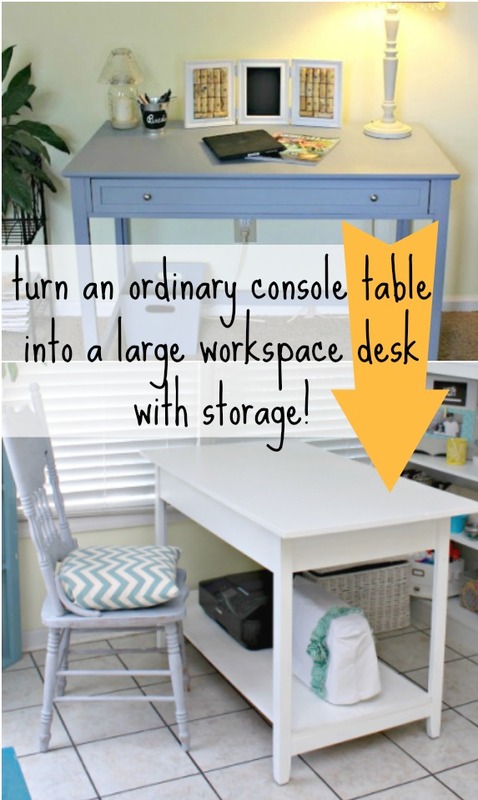 I have also seen modern desks with additional dividers in the box that add a little character. (If you are building the single panel desk, skip this step.) Cut the 1″x3″ into 2 or 3 – 16″ long pieces. You’ll want to sand all of the inner pieces of wood now, because they will be difficult to sand after assembly. Use wood glue and 1 1/2″ min brad nails to assemble the slim box. Make the 2 1/2″ x 16″ pieces flush with the ends of the panel. Nail from the panel into the 2 1/2″ x 16″ pieces from the top and bottom. If necessary, clamp the joints in place while the glue dries. On the backside of the panel, measure and mark 5″ from the ends and 1 9/16″ from the sides. You can also rotate your plate some to make the angled legs more defined from the side, and scoot your legs in a little more if you want, it just depends on the look you’re going for. Use the table leg angle top plate as a template and mark the screw holes. Drill small pilot holes, making sure not to drill all of the way through the panel. Secure the angle plates with 5/8″ screws. Repeat for each plate. Attach the legs onto plates. Remove any excess glue, apply wood filler to holes, cracks and blemishes and allow to dry. Sand the wood filler and desk until smooth finishing with 120-150 grit sand paper, always finish sanding in the direction of the grain. Apply stain or primer/paint to the desk and allow to dry. Apply a top coat/polyurethane/polycrylic as directed and allow to dry. Enjoy your handmade Mid-Century Modern Desk! I was looking for a new desk for my room, which is small and has very limited room for a desk – but I’m in college and need a nice place to study. So I found your plans for a mid-century modern desk and adapted the measurements to fit my personal needs and exchanged the wooden legs for steel hairpin legs. I LOVE the finished product and am super proud of myself since I’ve never built anything before – not even a bird house. Never built ANYTHING before? Anna, this is beautiful and looks professional! Thanks for sharing! Have you used one of our posts to create something beautiful that you’d like to share? We’d love to see it! Let us know here. Walking or Running: Which Exercise Should You Do? I have become very drawn to the look of mid century modern lately so I love this desk. Thank you for the instructions! Do you have any measurements or instructions for how you built the drawer for the desk? Where do I get tapered legs? You can buy them at Lowe’s, online at Home Depot or on Amazon. What materials would you recommend for making the drawer? I typically use 1/2″ or 3/4″ plywood to build drawers. This mid-century desk is just what I was looking for to go into my lounge! You’re awesome, thank you so much! I built this desk and found the legs are quite wobbly. I followed the directions- any advice? I am getting ready to build this desk. Did you figure out how to keep the desk legs from being wobbly? Can you describe where the legs are wobbling at? Uneven on the floor? Not tight in the mounting plate? The mounting plate loose? I screwed in the mounting plates very tight and the legs are screwed in as tight as I can get them- but there still appears to be wobble where the leg screws into the mounting plate. When you built the desk, did it feel sturdy? I looked at similar free plans on the Internet for a console table and the person who posted said there was some wobble/instability inherent because of the skinny legs – I was wondering if you had a trick for keeping the desk feeling sturdy/stable. My daughter and I built this and it is also very wobbly. The mounting plates are tight and the legs are screwed in as far as possible. The mounting plates are a little flimsy. They are from Home Depot..
Should the screw on top of the leg go into the wood? Amy, how would you recommend staining/finishing these pine boards to get a dark satin finish similar to the depicted?